In examining football statistics, sometimes there’s more information packed into a number than a few digits can convey. For instance, Zlatan Ibrahimovic has taken 77 unblocked shots and scored 16 goals, but these numbers don’t contain all the information we would want to know to determine his skill as a scorer or his goal threat when shooting. They don’t tell us where the shots come from or how often he converts a particular kind of shot. This is where a visualization can be extremely useful. Inspired by some of the work that Kirk Goldsberry did for NBA basketball, I collected shot data for 5 top footballers and made shot charts for each one. This post will be something of a test for how compelling the results are. First, a bit of explanation. The size of the hexagons on each chart represent the number of shots taken from within that zone, while the color represents the percentage of those shots which have been on target. The numbers over each hexagon correspond to the number of goals scored from each area. The first thing to point out on Ibra’s shot is that he has a shot from well within his own half (on target nonetheless), which seems very much in keeping with the insanity that is Zlatan. Next time I imagine that shot will be finding the back of the net. 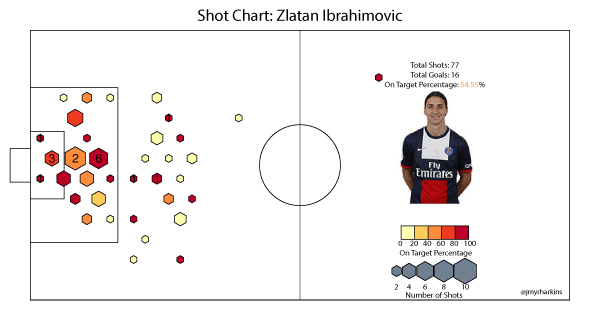 The chart shows that Ibrahimovic takes quite a few shots, not all of which are from particularly dangerous areas. 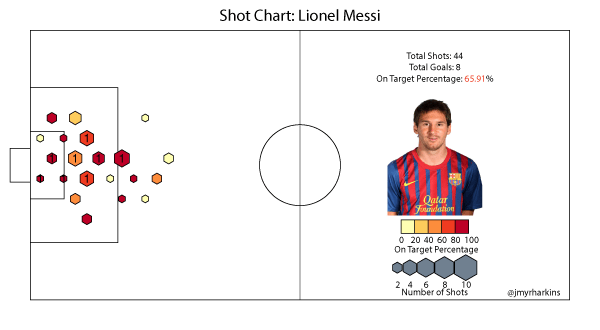 He does, however, gets his shots on target reasonably well from more dangerous areas. A good comparison for his chart is probably Cristiano Ronaldo, another high volume shooter who isn’t afraid to pull the trigger from distance. 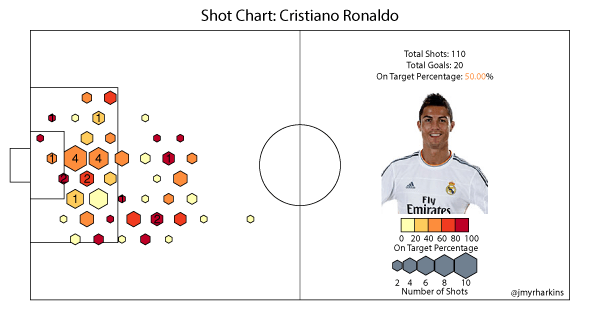 Cristiano Ronaldo, as the chart shows, will shoot from anywhere. Given his swerving shot, he’s probably the player you want shooting from range, but his chart shows that his on target rates in many areas suffer from his volume and his overall rate is sunk somewhat by his shot selection. He certainly scores a lot of goals, but this chart makes you wonder if some of it might be a result of sheer numbers in terms of shots taken. Luis Suarez is another player that fits in as a comparison for these two. Suarez’s chart reflects the kind of season he’s been having. His total volume is similar to Ibrahimovic, despite missing the first 5 games of the season through suspension. Even with the number of shots he takes, his on target rates from anywhere around the penalty area are consistently high. 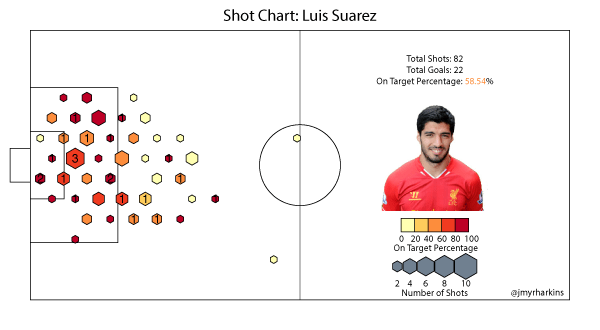 Suarez shoots from distance, but he really makes his money from 18 yards or closer. For a high-volume shooter, Suarez picks his shots a little more carefully than Zlatan, and certainly more so than Ronaldo, and given his form, it’s hard to question the results. If not for Suarez’s insane season, Aguero would probably be considered the in form striker in the Premier League. His chart makes for very different viewing than the previous three. He’s missed several games due to injury, which drives his total shot number lower than it might be if he had been fit all season. His chart still illustrates, though, how different his role is from all of the other players charted so far. Aguero relies much more on his finishing ability in the box than creating his own opportunities from distance. The location of his goals reflects this as well. His on target rate is extremely high inside the box. It suffers only when he shoots from acute angles on the left side of the box, where he would be mostly shooting with his non-dominant foot. Messi has played fewer league minutes (due to injury) than any of the above players so far this season, so his sample is somewhat limited. He’s not a high volume shooter compared to the likes of Ronaldo, but he takes quite a few shots per 90 minutes played. 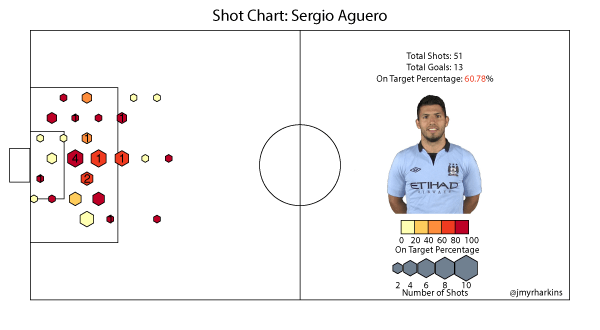 The distribution of these shots, though, looks a bit more like Aguero’s than any of the other players. This matches the image of Barcelona’s style. Messi often scores his goals by arriving to meet a squared ball at the end of one of Barca’s signature passing moves, and most of the time these kinds of opportunities fall right around the penalty spot. If it wasn’t already clear, this chart illustrates just how effective he is in this role. With the caveat of the smaller sample size, Messi has the highest on target rate of the group. There are certainly more things to say about these charts, and more patterns to find, but this is mostly a pilot run for this method of visualization. In the future I’d like to adjust the on target percentage scale to be relative to average rates from different positions, but unfortunately I don’t have those data yet. If you’d like to see someone specific charted, or have feedback or ideas for future versions, please let me know on Twitter or by commenting. The data consist of unblocked shots from domestic league matches up through January 18th. The data gathering was done by hand, match by match, using match reports from Squawka.com, which means it’s more likely that I committed an error with a shot or two than if I had access to a database of shot locations.